The National School Lunch Act was signed into law by President Truman more than 70 years ago and the lunch system for school-aged kids was forever changed. Since its inception in 1946, this school lunch act aimed to offer affordable and nutritionally sound meals to energize kiddos through the school day. Currently, over 100,000 schools participate in school lunch. The program offers government assistance and nutrition guidance from the USDA on both the federal and state levels. The system has undergone multiple changes over the last several decades, and some of the most interesting changes have taken place in the last decade. The school lunch program offers both food and financial assistance to schools that participate. Children who are eligible can receive meals for free or at a reduced rate to help ensure that even families who can’t afford it can have meals served to their kids during the school day. According to the USDA, meals are “nutritionally balanced” and meet standards set in the U.S. Dietary Guidelines. 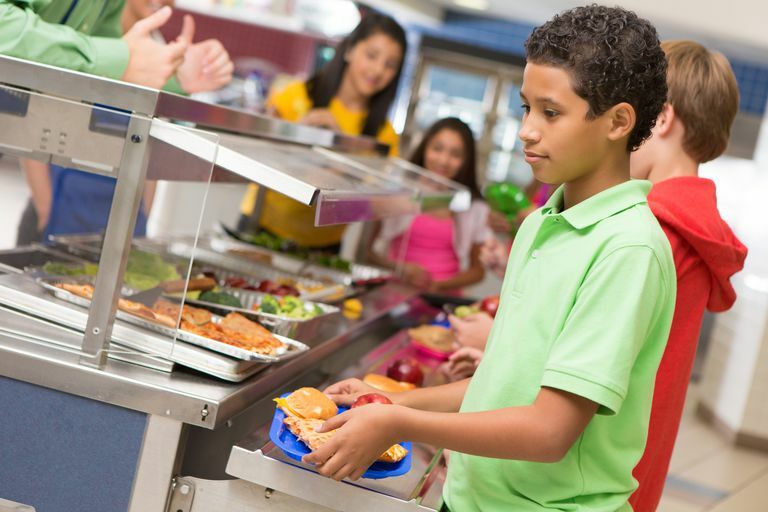 Meals are designed to meet age-appropriate goals for calories and important nutrients like calcium and vitamin D.
Meals are supposed to contain a limited amount of unhealthy fats and sodium, but despite these ambitious goals, many school lunch offerings are made from highly processed foods that lack nutritional substance. These meals sure don’t come cheap either, costing upwards of $11.5 billion at last reported count in 2012. The efforts put forth to make school lunch healthy have been noble and provide one of the most structured meals of the day for some children. Food service for large numbers of kids across different parts of the country poses many challenges, but national efforts to improve them began to surface in 2010. In 2012, The Obama administration installed initiatives to overhaul school lunch to make it healthier and ingredients less processed. Some of the specific guidelines of the Healthy Hunger-Free Kids Act included a reduction in sugar and unhealthy fats as well as a gradual decrease in sodium. These new school lunch initiatives also included increasing the availability of whole grains. Servings of whole grains moved to 50 percent of represented grains with an eventual goal for 100 percent whole grain offerings. These new standards also required that all trays leave the lunch line with a serving of fruit or vegetables on board. Despite some arguments over tomato paste and french fries counting as servings of veggies (which they do), many schools made efforts to increase exposure to healthy foods for students. Reviews about the success of the school lunch program and the upgrades set forth in 2012 are mixed. Some argue that the new healthier offerings are less palatable for youngsters while others argue not enough is being done to improve meal quality. In recent days, the Trump administration has signed even newer policies into place for the upcoming 2017-2018 academic year. Many of these initiatives call for the relaxation of some of the upgrades established in the Healthy Hungry-Free Kids Act. Specifics include a halt on sodium decrease and allowing flavored low-fat milks to be sold in schools instead of just the non-fat versions. Efforts to add more whole grains to meals will also be stopped. What do the modifications to school lunches mean for American families and parents looking out for their kids’ nutrition? The answer is unclear. Some kids will undoubtedly continue to complain about whatever the lunch lady is serving up. But, many children in need can benefit from an affordable meal at school each day. Nutrition experts are rightfully concerned that the loose regulations will open the door for more highly processed foods to enter the lunchroom. Parents’ best bet may be to brown bag it whenever they can and continue to educate their kids on healthy choices on the home front. USDA. National School Lunch Program. September 2013.